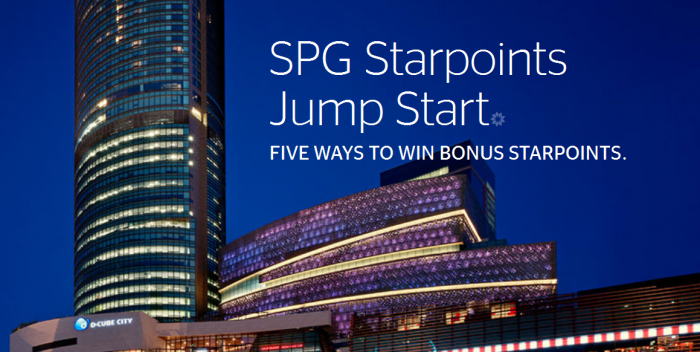 Starwood Preferred Guest (SPG) has launched Jump Start prize draw for new and some existing members in the Asia-Pacific. The promotion is valid for number of activities between April 15 – September 15, 2016, and requries registration. You can and access and try your luck register for this offer on SPG’s website here. Registration (200). Each winner will be awarded 200 Starpoints (ARV US$7). Spend $US10 (200). Each winner will be awarded 1,300 Starpoints (ARV US$45.50). Download/Activate SPG App (200). Each winner will be awarded 500 Starpoints (ARV US$17.50). Register Smartphone for Keyless Entry (200). Each winner will be awarded 500 Starpoints (ARV US$17.50). Qualified Stay (200). Each winner will be awarded 2,500 Starpoints (ARV US$87.50). This promo was not applicable for my SPG account that is based in one of the eligible countries. They are probably trying to get members activated that haven’t had any stays plus get new sign ups. Doesn’t hurt to see if your account is eligible. Won’t take more than couple of seconds and you never know if you end up winning something. 1. ELIGIBILITY: The SPG® Starpoints® Jump Start Prize Draw (the “Prize Draw”) is open only to new members who enrol in the Starwood Preferred Guest® (SPG) programme from 15 April 2016 until 15 September 2016 at Starwood Hotel and Resort properties participating in the SPG Starpoints Jump Start promotion, and to existing SPG members by invitation only. Participation is further restricted to SPG members who reside in one of the following countries: Mainland China and Asia Pacific Countries at Large, identified as American Samoa, Antarctica, Australia, Bangladesh, Bhutan, Brunei Darussalam, Cambodia, Christmas Island (Indian Ocean), Cocos (Keeling) Islands, Cook Islands, East Timor, Fiji, French Polynesia, French Southern Territories, Guam, Hong Kong, India, Indonesia, Japan, Kiribati, Korea (South), Lao People’s Democratic Republic, Macau, Malaysia, Maldives, Marshall Islands, Micronesia, Federated States of Mongolia, Myanmar, Nauru, Nepal, New Caledonia, New Zealand, Niue, Norfolk Island, Northern Mariana Islands, Palau, Papua New Guinea, Philippines, Pitcairn, Samoa, Singapore, Solomon Islands, Sri Lanka, Taiwan, Thailand, Tokelau, Tonga, Tuvalu, United States Minor Outlying Islands, Vanuatu, Vietnam, and Wallis and Futuna Islands. Participants must be at least 18 years of age or older and have reached the age of majority in their respective jurisdictions at the time of entry. Employees of Starwood Hotels & Resorts Worldwide, Inc., its affiliates, its agencies or any other company or persons directly connected with the administration of the Prize Draw, as well as the immediate family (spouse, parents, siblings and children) and household members of each such employee are not eligible. The Prize Draw is subject to all applicable federal, state, provincial and local laws and regulations. 2. SPONSOR: The Prize Draw is sponsored by Starwood Hotels & Resorts Asia Pacific PTE LTD (“Starwood”), 6 Temasek Boulevard, #24-04 Suntec Tower Four, Singapore 038986 (the “Sponsor”). 3. AGREEMENT TO OFFICIAL RULES: Participation in the Prize Draw constitutes entrant’s and entrant’s guests’ full and unconditional agreement to and acceptance of these Official Rules and the decisions of the Sponsor, which are final and binding. Winning a prize is contingent upon fulfilling all requirements set forth herein. 4. PROMOTION PERIOD: The Prize Draw begins at 9:01am Singapore Standard Time (SGT) on 15 April 2016 and ends at 11:59pm (SGT) on 15 September 2016 (the “Promotion Period”). Entries submitted prior to or after the Promotion Period will be disqualified. 5. PARTICIPATION: You must be a member of the Starwood Preferred Guest loyalty programme at the time of entry and at all subsequent times throughout the Promotion Period. Membership in the Starwood Preferred Guest programme is free. Visit spg.com/join. Only one (1) registration per person allowed during Promotion Period. New SPG member enrolled at Starwood Hotel property front desk will receive an instructional insert at participating properties in their key packet directing them to the promotion registration URL. Complete the registration and earn one (1) entry to win 200 Starpoints. Existing members will be provided a registration URL in their “by invitation” communications. Complete the registration and earn one (1) entry to win 200 Starpoints. Spend US$10 or more on point-able consumption (an eligible purchase such as dining or room incidentals, at a Starwood hotel or resort) and earn one (1) entry to win 1,300 Starpoints. Download the SPG app and activate membership in app and earn one (1) entry to win 500 Starpoints. Register your smartphone for keyless entry and earn one (1) entry to win 500 Starpoints. Book and consume an Eligible Stay during the promotional period, and earn one (1) entry to win 2,500 Starpoints. An Eligible Stay is defined as a stay, booked after registering in the promotion, subject to sections 6a–6e above, with at least one (1) eligible paid night at any of the over 1,300 participating Starwood hotels and resorts, paying an eligible paid rate during the Promotion Period (with a checkout posted to the member’s account on or before 15 September 2016). An Eligible Rate is any rate that is eligible to earn Starpoints in the Starwood Preferred Guest programme. Free Night Awards and Cash & Points Award nights are not eligible for promotional Starpoints earnings. A list of SPG-participating hotels and resorts and a description of Eligible Stays and Eligible Rates can be found at www.spg.com under the programme terms and conditions. See Section 1.4 for the complete definition of Eligible Rates but note that certain prepaid rooms where the booking is made through a third party (including but not limited to travelocity.com, expedia.com and booking.com) are not Eligible Rates and do not earn Starpoints or qualify towards promotional earnings. If your Eligible Nights do not appear on your SPG account within seven days of departure, please contact SPG customer service immediately. You must contact SPG customer service no later than 22 September 2016 to have any missing Eligible Nights post to your account to be credited for entry. * Activities 6b-e above may be completed in any order. ENTRY LIMIT: One (1) entry per Activity per person during the Promotion Period. Alternate Entry: To enter without completing Activities 6a–6e, send an email to SPGJumpStart@sweepsresults.com to earn one (1) entry in the Activity Prize Draw and one (1) entry in the Grand Prize Draw. LIMIT: one (1) entry per person per month during the Promotion Period (15 April 2016 until 15 September 2016). For All Methods of Entry: Sponsor is not responsible for Eligible Stays consumed within the Promotion Period that are not posted to the entrant’s SPG account subject to section 6d above; late, lost, illegible, incomplete, misdirected or postage-due entries by post; interrupted or unavailable network servers; other connection miscommunications, failed phone or computer or telephone transmissions; or technical failure or jumbled, scrambled, or misdirected transmissions or other error of any kind, whether human, mechanical or electronic, that may affect the Prize Draw. All entries become the exclusive property of the Sponsor, and none will be acknowledged or returned. Entrants are not permitted to share the same email, wireless phone number or SPG account. Any attempt by any entrant to obtain more than the stated number of entries by using multiple email or wireless phone numbers or accounts; identities, registrations and log-ins; or any other methods will void the entrant’s entries and that entrant may be disqualified. Use of any automated system or agency relationship to participate is prohibited and will result in disqualification. In the event of a dispute in regard to any entry or registration, the authorised account holder of the SPG account used to enter or register will be deemed to be the registrant or entrant. 7. PRIZE DRAW: Activity Prize Draw winners will be selected in a random Prize Draw conducted on the first day of each month and the sixteenth day of each month, starting 1 May 2016 and ending 16 September 2016, from eligible entries received during the Promotion Period. The Activity Prize Draw includes entries received from up to the prior day ending at 11:59:59pm. Example: A member who completes the registration Activity on 1 July 2016 will be included in the Activity Prize Draw of 16 July 2016. Each entry that occurs throughout the Promotion Period will be stamped with the date on which the participant’s entry is posted and the exact time of day that the entry took place (“Time Stamp”), and then recorded in Sponsor’s database. The recorded Time Stamp of the entry will determine which Prize Draw the entry will be eligible for. Ten (10) Activity Prize Draws will be conducted during the Promotion Period. Each Prize Draw will select one hundred (100) winners —twenty (20) per Activity/Registration. Ten (10) winners per Activity/Registration will be selected from the Mainland China entrants, and ten (10) winners per Activity/Registration will be selected from the Asia Pacific Countries at Large entrants. The Prize Draw will be conducted on Sponsor’s behalf in Saint Paul, Minnesota, USA, by Interactive Games (“Administrator”), an independent judging organization whose decisions as to the administration of the promotion and the selection of the potential winners are final. Odds of winning depend on the number of eligible entries received. LIMIT: One (1) Activity prize per unique winner during the Promotion Period. 8. REQUIREMENTS OF THE POTENTIAL WINNER: Except where prohibited, the potential winner may be required to complete and return an affidavit of eligibility and liability/publicity release (the “Affidavit/Release”) within two (2) days of being notified. If the potential winner fails to sign and return the Affidavit/Release within the required time period, an alternate entrant will be selected in his or her place in a random Prize Draw of all eligible entries received. Starpoints will credited to SPG member’s account within two to four (2 to 4) weeks from the Promotion Period end date and upon all eligibility verifications/validations. Use and expiry of Starpoints is pursuant to the terms and conditions of the SPG programme. No cash or other substitution may be made, except by the Sponsor, who reserves the right to substitute the prize with another prize of equal or greater value if the prize(s) are not available for any reason as determined by the Sponsor in its sole discretion. The prize(s) are not refundable, are nontransferable, and must be accepted as awarded. 10. PUBLICITY: Except where prohibited, by participating in the Prize Draw and regardless of whether you are a winner, you grant the Sponsor, its promotional partners and its subsidiaries, affiliates, and licencees an exclusive, irrevocable licence to use, alter, adapt, publish, distribute, copy, exhibit, display, market, promote, advertise, publicise, and otherwise exploit your name, signature, likeness and submitted entry photograph(s), as well as additional photographs, video footage or other images that the Sponsor may take of you or your designated guest, if you are a winner (in their sole discretion), in whole or in part, in any manner and for whatever purpose Sponsor shall elect, in any and all languages, and in any and all media now known or hereinafter developed, including but not limited to website, television, radio and/or printed materials, worldwide in perpetuity, without further compensation, notification or permission. You or your designated guest shall not claim or be entitled to receive any compensation or credit for such use. 11. PRIVACY: By providing entry information, you authorise Starwood to collect, process and use such information for lawful, Starwood-business-related purposes, and to store your information at and transmit it to various locations throughout the world, either directly or through third-party vendors, whether within your country of residence, the United States, or elsewhere. To learn more about our data collection and usage practices, please see our Privacy Statement at starwoodhotels.com. 12. GENERAL CONDITIONS: In the event that the operation, security, or administration of the Prize Draw is impaired in any way for any reason, including but not limited to typographical errors, fraud, virus, or other technical problem, or any condition caused by events beyond the reasonable control of the Sponsor that may cause the Prize Draw to be disrupted or corrupted, the Sponsor may, in its sole discretion, either (a) suspend the Prize Draw to address the impairment and then resume the Prize Draw in a manner that best conforms to the spirit of these Official Rules or (b) award the prize at random from among the eligible entries received up to the time of the impairment. The Sponsor reserves the right in its sole discretion to disqualify any individual it finds to be tampering with the entry process or the operation of the Prize Draw, or to be acting in violation of these Official Rules or in an unsportsmanlike or disruptive manner. Any attempt by any person to undermine the legitimate operation of the Prize Draw may be a violation of criminal and civil law, and, should such an attempt be made, the Sponsor reserves the right to seek damages from any such person to the fullest extent permitted by law. The Sponsor’s failure to enforce any term of these Official Rules shall not constitute a waiver of that provision. 13. RELEASE AND LIMITATIONS OF LIABILITY: By participating in the Prize Draw, entrant and his or her designated guest agree to release and hold harmless the Sponsor and its officers, directors, employees and agents (the “Released Parties”) from and against any claim or cause of action arising out of participation in the Prize Draw, or receipt or use of any prize, including, but not limited to (a) unauthorised human intervention in the Prize Draw; (b) technical errors related to computers, servers, providers, or telephone or network lines; (c) printing errors; (d) lost, late, postage-due, misdirected, or undeliverable post; (e) errors in the administration of the Prize Draw or the processing of entries; or (f) injury or damage to persons or property which may be caused, directly or indirectly, in whole or in part, from entrant’s participation in the Prize Draw or acceptance, receipt use or misuse of any prize. Entrant further agrees that in any cause of action, the Released Parties’ liability will be limited to the cost of entering and participating in the Prize Draw, and in no event shall the Released Parties be liable for attorney’s fees. Entrant waives the right to claim any damages whatsoever, including but not limited to punitive, incidental, consequential, direct or indirect damages. Sponsor is not responsible if any prize cannot be awarded due to travel cancelations, delays or interruptions due to acts of God, acts of war, natural disasters, weather or acts of terrorism. 14. DISPUTES: Except where prohibited, entrant agrees that any and all disputes, claims and causes of action arising out of, or connected with, the Prize Draw or any prize awarded shall be resolved individually, without resort to any form of class action, and exclusively by the appropriate court located in the State of New York, USA. All issues and questions concerning the construction, validity, interpretation and enforceability of these Official Rules, entrants’ rights and obligations, or the rights and obligations of the Released Parties in connection with the Prize Draw, shall be governed by, and construed in accordance with, the laws of the State of New York, without giving effect to any choice of law or conflict of law rules (whether of the State of New York or any other jurisdiction), which would cause the application of the laws of any jurisdiction other than the State of New York.